My students do not get to go to an art class in our school. In order to have any art at all, I have to find time to do it myself. I heard about Directed Drawings a couple of years ago and decided to try them with my class. Since then, I have been in love! Directed Drawings are step-by-step drawings directed by the teacher to draw all sorts of things. There are tons of examples of Directed Drawings on Teachers Pay Teachers or by doing a Google Search. My favorite this year, however, is using Art for Kids Hub on YouTube. This channel has hundreds of Directed Drawings. The best part is a few minutes rest for the teacher (aka Me) while the students watch the videos! The benefits of Directed Drawings go beyond art and creativity. The biggest benefit, to me, is getting students to follow directions. 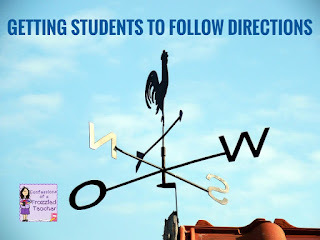 If you want more tips on getting students to follow directions, click on the pic below.